Was the failure to solve the US energy crisis of the 1970s a product of bad government policy, or of voters demanding that their government do the impossible? On December 4, 1973, roughly 100 long-haul truckers parked their rigs on Interstate 80 on the Pennsylvania side of the Delaware Water Gap and effectively shut down traffic on a well-traveled section of a transcontinental expressway. The truckers’ action followed weeks of gasoline shortages and uncertainty about the nation’s fuel supply. In October, the oil-producing nations of the Persian Gulf had announced an embargo on imports to the United States in order to punish the country for siding with Israel during the Yom Kippur War. Service stations ran short of gasoline. Panicky drivers made the problem worse by repeatedly topping off their tanks in anticipation of future shortfalls, which clogged gas stations and forced other drivers to waste fuel waiting in line. But the shutdown in Pennsylvania—which soon evolved into an unofficial strike by tens of thousands of drivers—introduced an element of chaotic violence to the crisis. Striking truckers slashed tires and cut brake lines. A driver in Pennsylvania died when a striker on an overpass dropped a rock on his vehicle, smashing the windshield. In Delaware, someone shot a trucker from a passing car with a 12-gauge shotgun. The chaos on the roads underscored the frustration, bordering on desperation, of the general public. Winter was coming, along with a seasonal surge in demand for fuel, heat, and electricity, and there was no end in sight to the petroleum shortage. In Panic at the Pump, historian Meg Jacobs recounts the events that produced the truckers’ strike—namely, an “energy Pearl Harbor” that threatened the US economy and car culture—and their consequences for US politics and public policy. She begins her story in 1948, when a Yale-educated World War II veteran named George H.W. Bush turned down a job with his father’s New York investment bank (though not his critical business connections) in order to seek his fortune in the Texas oil patch. She concludes it in the early 1990s, when the same George Bush, now president of the United States, ordered US troops to the Middle East in order to check the territorial ambitions of Saddam Hussein’s Iraq and to keep Gulf oil flowing. But the bulk of her book takes place in the 1970s, when an American way of life—driving gas-guzzling cars made in Detroit around a low-density suburban environment—seemed like it might be lost forever. Jacobs explains how oil politics provoked divisive policy battles within the Nixon, Ford, and Carter administrations, and between those presidents and Congress. And she shows how several years of highly active, at times even frenetic policy-making failed to offer striking truckers, frustrated families, and energy-starved utilities what they had all come to rely on: plentiful energy from refined fossil fuels at a reasonable price. The result, Jacobs notes, was a decade-long “object lesson in the limitations of governmental power” that divided the Democratic Party, helped elect Ronald Reagan to the presidency, and gave an edge to free-market conservatives as they made their case for further deregulation and decontrol of the economy. Jacobs, a historian at Princeton University, tells this story in a straightforward and accessible narrative style. Indeed, her narrative is a little too straightforward—an occasional pause for some extended scene-setting or the longer introduction of a key historical figure would have offered a welcome change of pace. Jacobs hasn’t stumbled upon a previously obscure topic here: The gas lines generated enormous media attention in their day, and the oil embargo is a staple of undergraduate classes and popular histories of the 1970s. But she has unearthed an immense quantity of internal correspondence, policy memos, and public statements from multiple administrations that help explain how the crisis played out behind closed doors along the corridors of power. Instead of retelling a well-worn story about the US economy temporarily “held hostage” by a bunch of “Arab sheiks,” Jacobs explores the deeper transformation of policy ideas made possible by the energy crisis and the way that Washington insiders handled it. She shows how the issue pitted Republicans against Republicans and Democrats against Democrats, and how presidents in both parties made decisions that openly contradicted their gut instincts on economics, often for fleeting moments of short-term political advantage. Indeed, the chaos within the DC policy establishment made the actions of the striking truckers seem, in one sense, almost orderly: At least the people driving the big rigs knew what they wanted. As Panic at the Pump reminds us, the road to the energy crisis began with the massive transformation of the American society unleashed by the automobile. From the end of World War II through the late 1960s, in particular, the United States experienced robust economic growth and massive internal migration, as Americans moved from the Northeast and Midwest to the South and West, and from big industrial centers to the automobile-centric suburbs. Meanwhile, Jacobs argues, mainstream policy makers from both the Democratic and Republican parties fashioned a consensus understanding of the nation’s political economy based on recent experience. Thanks to the New Deal and the national mobilization for two world wars, the vast majority of policy makers believed that “politics and the market did not exist in separate spheres but were one,” and that “wages, prices, profits [and] production—all resulted as much from negotiations in congressional hearing rooms…as from the wheels of commerce.” In the realm of energy policy, this understanding justified government subsidies and protections for the US oil industry (which benefited from restrictions on cheap foreign imports and a “depletion allowance” that lowered corporate taxes), as well as occasional policies designed to protect consumers (who benefited from price controls on natural gas sold in interstate commerce). In an era when petroleum was easy to come by, neither government protection of domestic industry nor the occasional consumer subsidy provoked serious political conflict. That began to change by the early 1970s. Domestic oil production plateaued and began to decline as easy-to-find, easy-to-drill wells were exhausted. The environmentalist movement burst onto the national political scene, galvanized in part by a massive 1969 crude-oil spill in California’s Santa Barbara Channel. Congress passed a series of laws intended to curb air and water pollution, enforce stricter safety standards, and protect large swaths of the public domain from extractive industry. As domestic sources of fossil fuel became more expensive and less accessible, American oil companies looked abroad—especially to the Persian Gulf—to fill the gap between domestic production and consumption. Even before the Arab oil embargo spurred an immediate crisis, a number of observers worried that the United States had a serious energy problem. The “public is baffled,” Nixon speechwriter David Gergen noted in the summer before the embargo. “Why should the most prosperous people in the world face [the] prospect of freezing homes and empty gas pumps?” And in an economy that was already experiencing an above-average rate of inflation, an energy problem was especially bad news. Factories used fossil fuels (or the electricity generated by them) to run machines; offices needed electricity for light and oil or gas for heat; and trucks used gasoline to transport goods to market—all of which meant that increases in fuel prices could put additional upward pressure on prices in general. The Nixon administration responded to inflation with a series of top-down interventions in the economy. Using the authority granted to him by a Democratic Congress (which didn’t necessarily expect that he would use it), Nixon instituted temporary wage and price controls across the economy in 1971. Most of these were phased out a few months later, but the government regulation of oil prices continued, out of concern that consumers would face a massive and politically untenable increase the moment the controls were lifted. Nixon established a White House office on energy policy and created the interdepartmental position of energy “czar” to coordinate it, eventually leading to a system in which officials could allocate resources on a regional basis to ensure that New England didn’t run out of gas while service stations in West Texas were overstocked. Nixon wasn’t always enthusiastic about these initiatives; a brief job in the New Deal–era Office of Price Administration had soured him on government management of the price system. But he worried that failing to take action would be political suicide for himself and the Republican Party, since Democrats were sure to blame his administration for both the inflation and the shortages. And that political calculus ultimately won the day. As the sense of crisis deepened, federal initiatives multiplied. 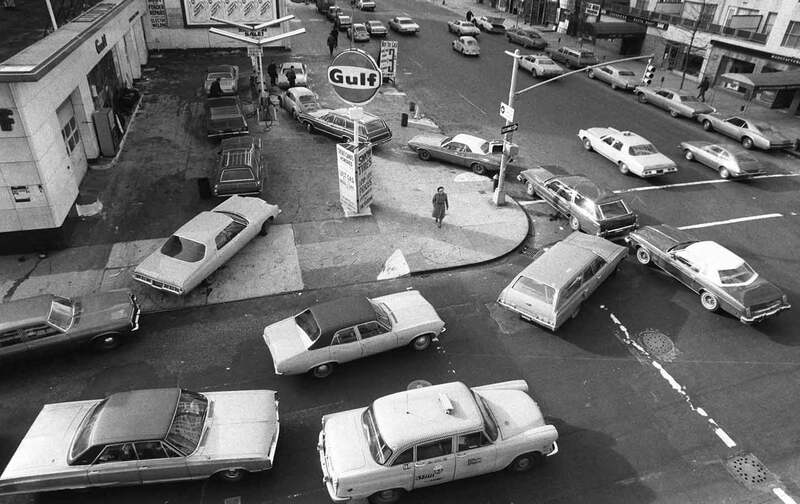 In 1974, energy czar William Simon “flooded the market” by releasing future gasoline allocations early, which he hoped would end the short-term panic without creating a worse shortage later on. (Gas lines did shorten considerably as a result.) Despite a strong personal commitment to free-market economics, President Gerald Ford signed Democratic-sponsored legislation that extended price controls for three more years. After defeating Ford in the 1976 election, Jimmy Carter tried to adjust the policy regime further: His administration began to phase out price controls while simultaneously taxing the “windfall profits” of the energy companies that stood poised to benefit when rates went up. Carter also signed the Emergency Natural Gas Act and created a Cabinet-level Department of Energy. He, too, faced an international crisis that threatened imports from the Gulf: After an Islamic revolution in Iran, a major oil producer and trading partner, toppled the US-backed shah, weary American consumers faced another round of shortages, lines, and economic unease. Carter’s energy program went beyond tinkering with public policy; far more than Nixon or Ford, he made a full-fledged effort to sell voluntary conservation and alternative energy as a solution to long-term shortages. In 1977, he declared that the energy crisis was the “moral equivalent of war” and would require a similar sort of public mobilization. Carter asked Americans to make a variety of personal sacrifices—“to take no unnecessary trips, to use carpools or public transportation whenever you can, to park your car one extra day per week, to obey the speed limit, to set your thermostat to save fuel”—in the hopes that the country could conserve its energy independence. Carter believed that, over the long haul, higher fuel prices would also be necessary to spur efforts to improve fuel efficiency and to invest in alternative technologies. Like his Republican predecessors, however, Carter faced a public that had come to believe that it had a right to cheap and plentiful gas—and expected the government to make it flow. Liberals in Congress hammered the president on the issue. Senator Ted Kennedy complained that Carter would “force the poor to choose between food, medical care, and keeping warm” in the winter. Telling Americans that they were supposed to make do with less was not an option. Ford wound up disappointing these officials when he surrendered on price controls. Of course, those very concessions meant that the “Mohicans” could claim vindication whenever the shortages reappeared: If only Washington had adopted full deregulation of the energy market, they would explain each time, supply and demand would again achieve balance, and gas would be available for anyone who could afford it. But, as Jacobs explains, the Democratic Party faced a deeper—and more consequential—internal divide. Democrats from urban, union-heavy districts tended to support policies designed to boost manufacturing and reduce unemployment, even at the cost of pollution or inflation, while Democrats from more affluent suburban districts wanted tighter environmental regulations and worried more about rising prices. Many rank-and-file Democrats in both camps believed that the energy crisis was essentially fake, that the oil companies had used the Arab embargo to gouge consumers. “The more people who are cold and out of work and out of school, the easier it is to stampede the nation into a deregulation frenzy,” cautioned James Flug, who ran the Energy Action Committee, a liberal public-interest group. But the Carter administration either didn’t share that analysis or didn’t believe there was any politically realistic way to force the oil companies to play ball. Instead, the president insisted that the country had to make some tough choices—unemployment or inflation, higher prices or gas shortages, a warm home or less driving—and urged Americans to sacrifice personally for the sake of the common good. Americans responded by voting Carter out of office. That meant the “free market” wing of the GOP was in an excellent strategic position after Reagan trounced the demoralized and divided Democrats in the 1980 presidential election. Upon taking office, Reagan immediately decontrolled oil and gas prices. He also made new domestic oil and gas production a top priority, and took aim at any environmental regulations that stood in the way. Reagan put the vocal anti-environmentalist James Watt in charge of the Department of the Interior and Colorado right-winger Anne Gorsuch in charge of the Environmental Protection Agency. This relaxed approach to the environmental consequences of extractive industry didn’t turn the United States into a net petroleum exporter. But Reagan got lucky: Despite several regional crises in the Middle East, oil flowed relatively freely from the Persian Gulf in the 1980s, while financial innovations in the futures markets tempered some of the real-world consequences of volatile prices. Without historically high prices to spur Congress into action, the Reagan-era deregulation held up. Long lines or “No gas today” signs at service stations became a 1970s period detail, a relic of the past. When Middle East politics once again imperiled the flow of oil from the gulf—this time because of Saddam Hussein’s 1990 invasion of Kuwait—the federal government responded with massive intervention of a different sort: It sent an army to the Middle East to blast the Iraqis out. What should we make of this story? Jacobs is no doubt correct that the failure of price controls and regional allocation programs to “solve” the energy problems of the 1970s helped conservatives to make a case for their preferred alternatives: deregulation at home and military adventurism abroad. It is less clear where Jacob lays the blame for those failures. Panic at the Pump explains what many different people were thinking but offers relatively few independent assessments of their claims. Was it fair for liberals to blame Big Oil for the energy crisis, or was that a self-serving myth designed to evade the hard choices? Was the failure to solve the energy crisis a product of bad policy, or of voters demanding that their government do the impossible? When Jacobs does make judgments, they are sometimes vague or noncommittal. For example, she writes that policy makers in general were “stuck in the past” but doesn’t explain how or why. Did they apply a policy toolbox designed to combat Depression-era poverty and deflation to a different sort of economic malaise? Or did they ignore advances in economics and administration that had rendered that toolbox obsolete? I can imagine a Chicago School enthusiast reading Panic at the Pump as an indictment of government policies designed to control prices and ration supplies, and a Marxist reading it as a case study of a capitalist economy exhausting nature and then seeking fresh resources to exploit—by force, if necessary (as is usually the case). In this regard, Jacobs has missed a chance to offer her own, perhaps more original lesson. Of course, one of the challenges of assigning credit or blame is trying to determine what real options policy makers had, and to what extent they were constrained by economic or political circumstances. It’s easy enough, in retrospect, to imagine a better progressive response to the energy crisis. Policy makers could have invested more public money, at an earlier date, in renewable energy, conservation, and efficiency. They could have investigated the oil industry to determine whether it was engaging in price-fixing or other unfair business practices. They might have avoided staking the reputation of economic regulation on the ability of the government to control the price of a highly sought-after commodity that traded around the globe. They might have found other means of ensuring that grandmothers on fixed incomes didn’t freeze to death during a harsh winter. But those policies may not have succeeded with any real-world electorate. And even if they had, they were unlikely to have saved the Democrats’ New Deal coalition, which was tottering as the result of the Vietnam War, racial conflict, and the rise of the counterculture long before energy became a salient political issue. They probably would not have spared Jimmy Carter from the consequences of what may have been, in retrospect, his most fateful decision on economic policy: whether to put Paul Volcker, an anti-inflation hawk, in charge of the Federal Reserve. As much as Carter wanted to believe that the United States could conserve its way to price stability, the energy crisis was only one factor in the rising inflation rate. The brutal double-dip recession that Volcker tolerated for the sake of combating inflation may have done far more damage to the New Deal image of the Democrats as champions of middle-class consumers—the political reality behind most economic regulation—than all of the bipartisan mistakes on energy policy put together. Perhaps a more effective response to the energy crisis might have cut into the inflation rate and made the Volcker recession less necessary—or not quite as harsh. Perhaps a better use of government power—and a more honest reckoning with the limits of that power—might have mitigated the liberal and progressive policy catastrophe that was the Reagan era. Near the end of Panic at the Pump, Jacobs notes that in ditching price controls, the Reagan administration threw a bunch of healthy babies out with the bathwater. It pointedly removed the solar panels that the previous administration had installed at the White House, to send the message that Carter’s defeat had discredited even the concept of renewable energy. Plans for improving and expanding alternative energy developed in the 1970s languished in the ’80s and ’90s, while a new era of cheap gas helped popularize heavy, gas-guzzling sport-utility vehicles. By the time the first Gulf War ended, former energy secretary James Schlesinger admitted: “It’s a hell of a lot easier and a lot more fun to kick asses in the Middle East than make sacrifices and practice conservation.” Unfortunately for the future of the climate—not to mention the people of the Middle East—this seems to be the lesson that many Americans have taken to heart. Jefferson DeckerJefferson Decker is an assistant professor of American studies and political science at Rutgers University, New Brunswick, and the author of The Other Rights Revolution: Conservative Lawyers and the Remaking of American Government (Oxford University Press).